Even though today’s media culture has up-rooted itself from the traditional paper-print media, some of the original automotive publications remain to be a valid staple in determining benchmark vehicles. Car and Driver, who has properly rooted themselves on the internet and in digital form, have named their list of 2013 10Best Cars. For many years manufacturers have prided themselves in making Car and Driver’s 10Best list. Some have taken the crown home many times for the same vehicle for over a decade. Having a consistent base for testing and giving virtually the same vehicles lineup a chance to join the elite has always been part of the 10Best car competition. 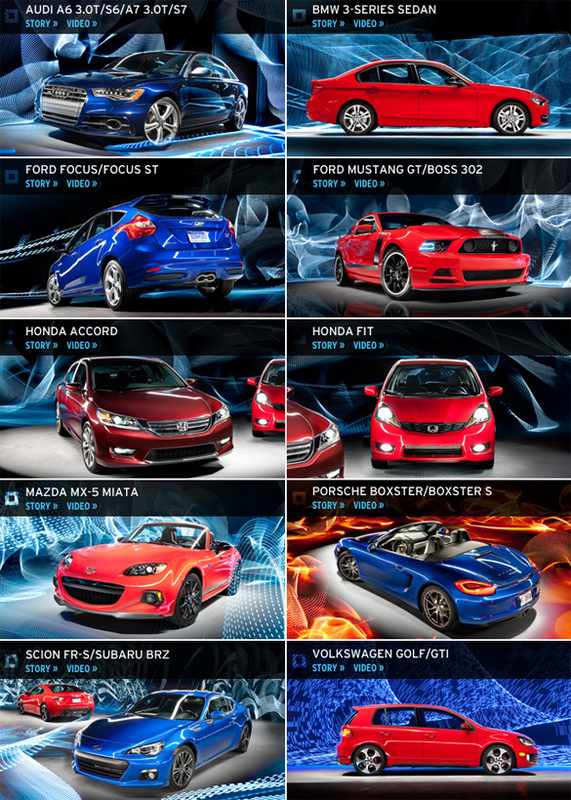 Below is a full list of all of Nominees as well as the winners for Car and Driver’s 2013 10Best Cars. NOMINEES CONSIST OF ALL-NEW CARS, 2012 10BEST WINNERS, CARS THAT WERE NOT AVAILABLE FOR THE 2012 COMPETITION, AND THOSE WITH SIGNIFICANT UPDATES. ALL CARS MUST FALL UNDER OUR BASE-PRICE CAP OF $80,000 AND BE ON SALE IN JANUARY 2013.